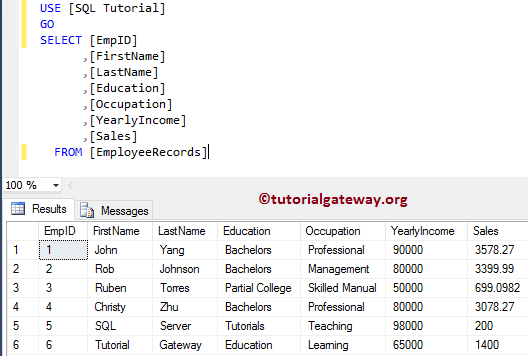 SQL Transaction is helpful to execute one more statements as a set. 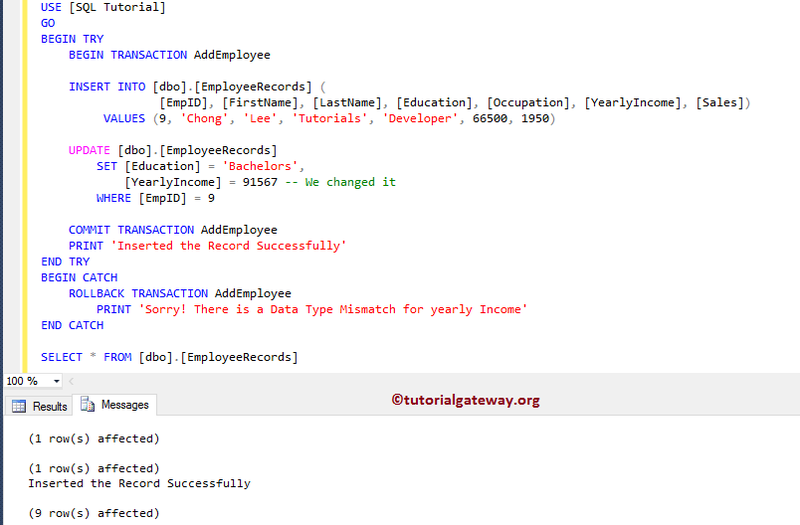 If a transaction is successful, all the changes made in that transaction will be applied to the table. If any single statement inside the transaction encounters error then changes made in that transaction will be erased, or rolled back. 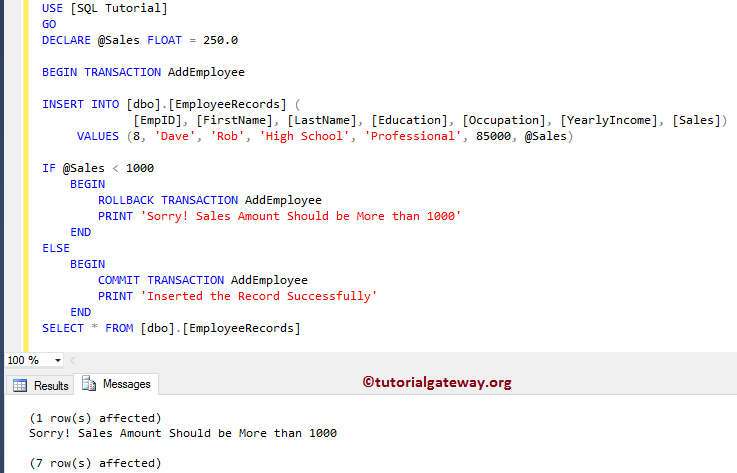 The following are the list of things that you should remember while working the SQL server Transactions. Every Transaction in Sql Server must end with either COMMIT, or ROLLBACK statements. 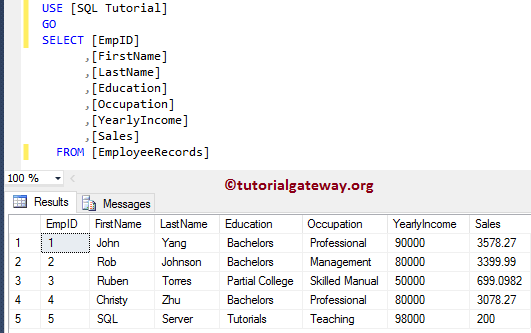 In this article we will show you list of various example that can explain the SQL Transaction. They are: BEGIN TRANSACTION, COMMIT TRANSACTION, ROLLBACK TRANSACTION, named transactions, Transactions inside the IF ELSE, and Sql Server Transactions inside the TRY CATCH block. 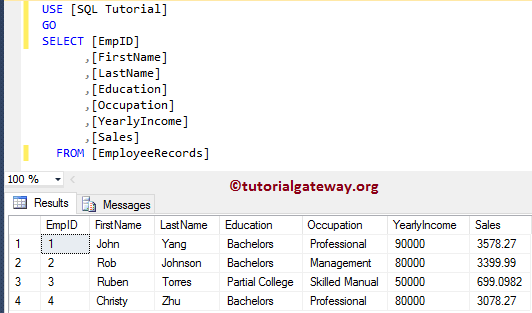 In this Sql Server transactions example we will place a INSERT INTO SELECT statement inside the BEGIN, and COMMIT transaction. As you can see, it will select top four records from Employee table, and store them in Employee Records table. Let us see the inserted records in Employee Records table. Let me show you the records in Employee table after that transaction. The Statements inside a transaction is executed as a set, and if one statement fails, then remaining statements with not execute. This process is also called as Auto Rollback transactions in SQL. This time we will deliberately fail one statement inside the SQL Transaction. As you can from the below screenshot, Update statement will return an error because we are entering the string (VARCHAR) information into the float data type. As you can from the below screenshot, though there is an error at Update statement. We are unable to see the inserted record because, it is roll backed by the SQL. Let me remove the BEGIN TRANSACTION, and COMMIT TRANSACTION from the above code snippet, and execute the statements. As you can see from the below screenshot, it has inserted the new record of Emp Id 6 but failed to update. Rollback transaction in SQL is useful to roll back any transaction to either beginning of the transaction, or to the transaction save point. 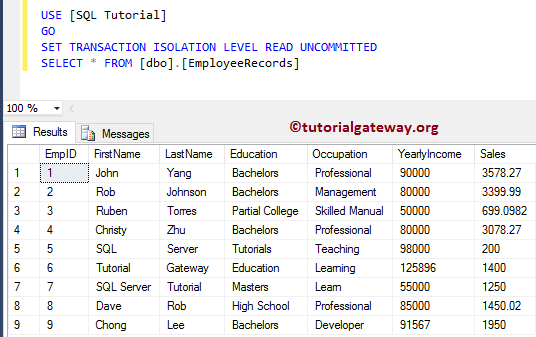 You can use this SQL Rollback to remove the half completed rows, or to handle errors. 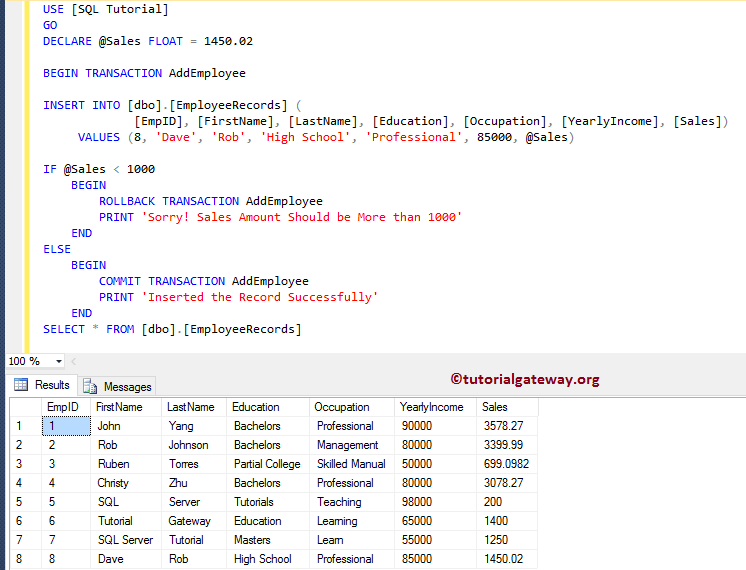 For example, if your sql transaction is inserting new record, and it throws an error then you can use this rollback transaction to revert the table to original position. 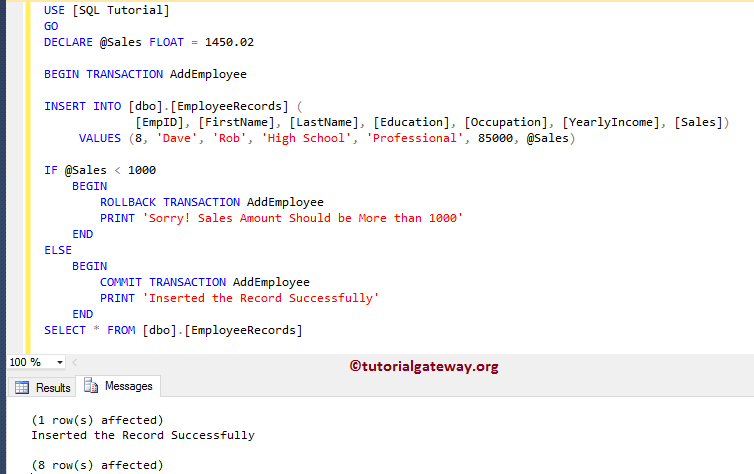 In this example, we will insert a new record into the Employee table, and apply the rollback transaction after the insert. 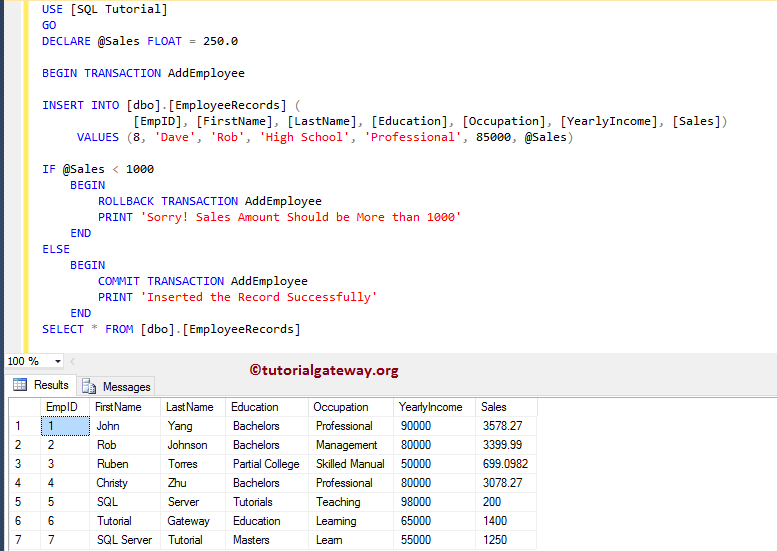 To demonstrate this we are using Select Statement inside a Transaction, and outside the transaction. First select statement will show you the table records before the transaction is completed. Though there is no error in the above statement. As you can see from the above screenshot, it has not inserted the record. 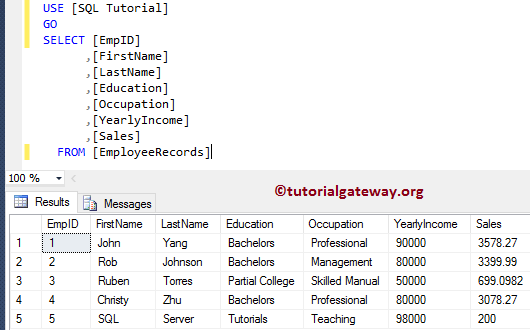 SQL Server allows you to name your transaction. When you are working with multiple transactions in one query, it is always advisable to use the named transaction. 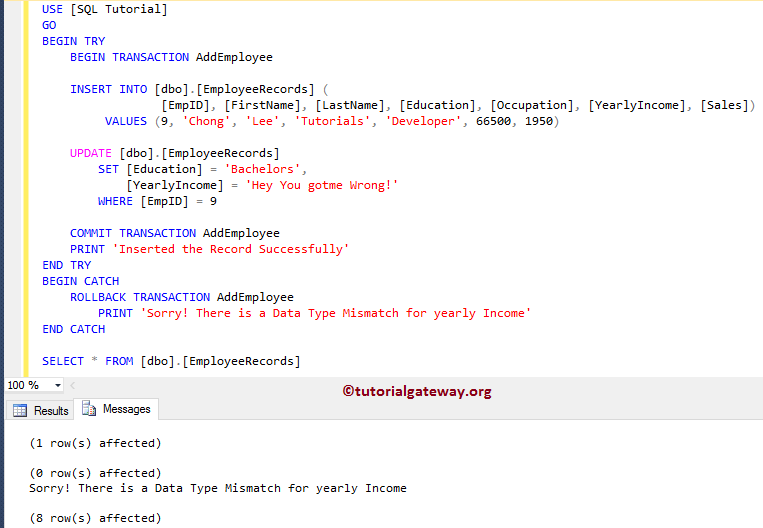 SQL Server Transactions are much useful, if we place them inside any conditional statements such as: IF ELSE. For instance, checking for the existing records in employee table before the insertion, and if it is there then rollback, else commit etc. 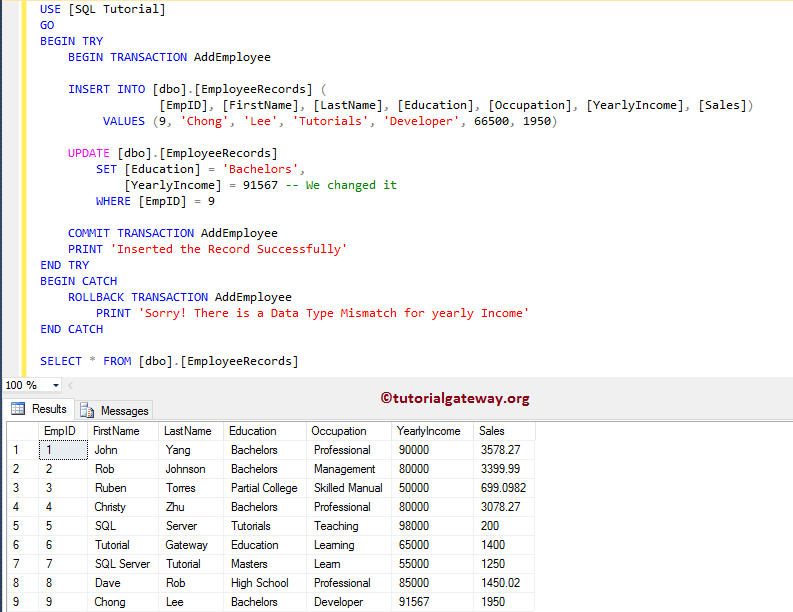 Below statement is a simple Sql Server Transactions example, where we declared a variable (assuming user going to enter the value). Next, we used insert statement, next within the If we are checking whether the @sales is less than 1000 or not. 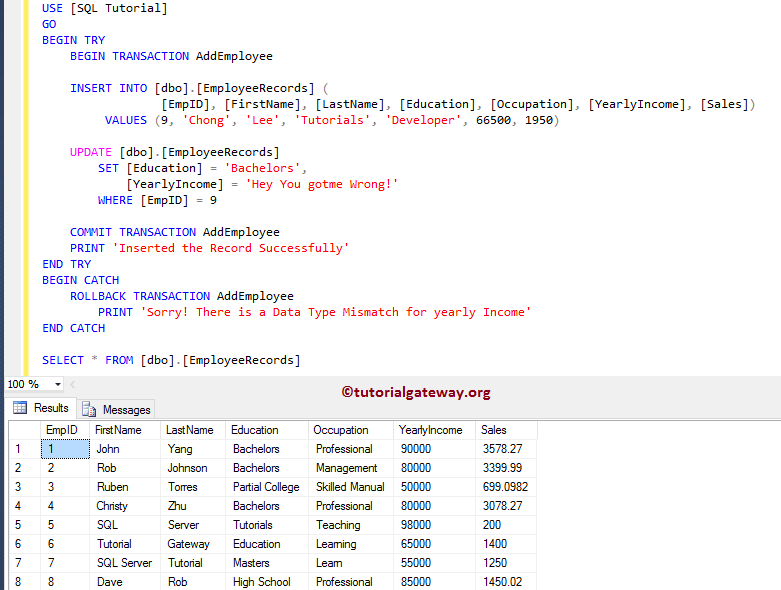 If it is true then ROLLBACK the transaction otherwise, Commit the transaction in SQL Select statement. let me show you the result data in employee table. SQL Server Transactions are very useful, if we place them inside TRY CATCH block. For instance, if there is an error inside the transaction then you can use the catch block to rollback the transaction to original position. 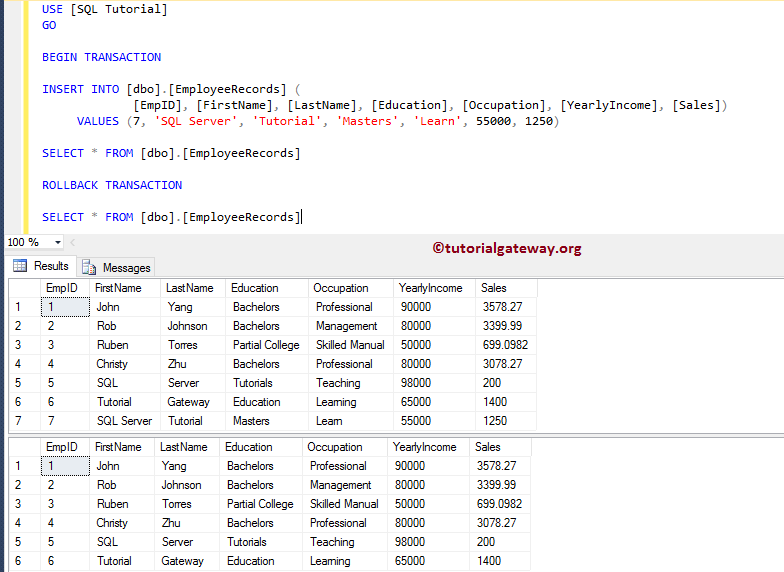 The below statement is a simple SQL Transactions example, where we placed one select, and one update statement inside the Sql Server transaction. If you observe closely, our update statement will throw an error because of data type conflict. 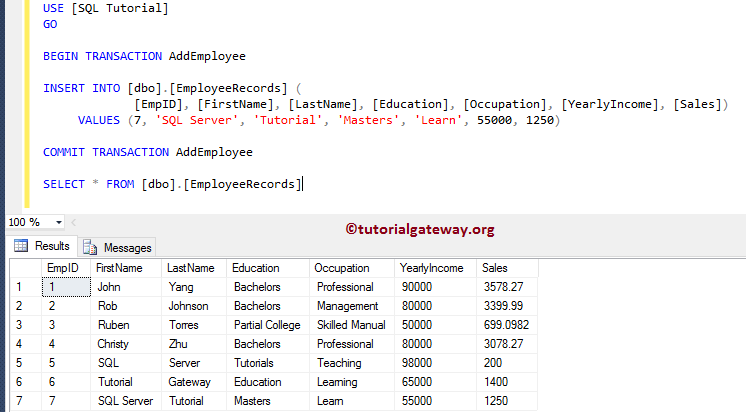 Let me open one more query window (click New query in SSMS), and write a simple select statement to select all the records in Employee Records table. From the below screenshot you can see, the execution is taking longer than usual. This is because, by default Select statement will return the committed data, and we forgot to commit the update. Let me set the SQL Transaction Isolation level to Read Uncommitted. This will read the uncommitted data.